We’re located in Ohio, so the closer you are to the Buckeye state, the faster you’ll receive your order! Note that orders paying via check will not be shipped until payment is received. Q: Why does shipping cost almost as much as the book? A: This is the case for single orders and it drives us crazy. We’re working to find alternative solutions for shipping, but this is the most cost-effective method we’ve found so far. The good news is that orders up to 5 books usually cost the same as a single book order. That’s why we recommend ordering for your section (or your entire band)! Q: What is the size of the book? A: The dotbooks are roughly 4.25″ x 5.5″ . Q: How many sets can fit in the dotbook? A: The dotbook comes with enough room for 120 sets (60 pages front and back). A: Yes! We believe the dotbook works best when the whole ensemble utilizes them, so we will offer discounts for bulk orders. Please contact us at sales@marchingdotbook.com for more information about our discounts. A: You can pay via credit card directly on our website, via PayPal, check or money order. Checks should be made payable to MarchingDotBook.com and sent to Marching DotBook 211 E. Schrock Rd. Westerville, Ohio 43081. Orders will not be shipped until payment is received. A: Yes! Once we have a PO number, we will fill and ship your order. Contact us at sales@marchingdotbook.com to set up a bulk order. A: You will receive an email with your USPS tracking number once your order ships. 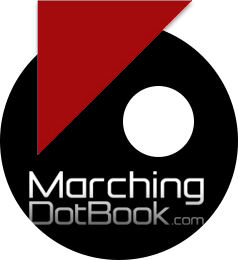 A: If your dotbook has not shipped, contact us at info@marchingdotbook.com and we can issue a refund. We cannot issue a refund for any dotbook that has been used. Q: What if the dotbook gets damaged during shipping? A: If you suspect any shipping damage when you receive your dotbook, please contact us immediately at info@marchingdotbook.com and save all shipping and packing material. Marching DotBook 211 E. Schrock Rd. Westerville, Ohio 43081 and then we will process your refund. A: After adding items to your cart, type in your coupon code in the gray box and click “apply coupon”. Q: I tried to contact you in your online chat but no one answered. A: We do our best to answer questions as quickly as possible. If the live chat is turned off, it will indicate “offline” in the top left corner and we will receive an email with your questions and/or concerns. We will respond within one business day.